At the invitation of Premier Li Keqiang of the State Council, Prime Minister Patrice Trovoada of the Democratic Republic of Sao Tome and Principe will pay an official visit to China from April 12 to 18. At the invitation of Foreign Minister Wang Yi, Jean-Marc Ayrault, Minister of Foreign Affairs and International Development of the French Republic will pay an official visit to China from April 13 to 14. At the invitation of Foreign Minister Wang Yi, Foreign Minister Riad Malki of Palestine will pay an official visit to China from April 12 to 15. Q: The US launched 59 Tomahawk cruise missiles at multiple targets at an airfield in Homs, Syria, as they believe it was from this airfield that the Syrian government force launched the chemical weapons attack. What is China's comment on that? A: China's position on the issue of chemical weapons is consistent. We oppose the use of chemical weapons by any country, organization or person for any purpose and under any circumstance. We condemn the latest chemical weapons attack in Syria. China supports relevant UN agencies in carrying out independent and comprehensive investigations into all uses or suspected uses of chemical weapons and, on the basis of solid evidence, reaching a conclusion which can stand the test of history and facts. We have noted the latest developments. What is imperative now is to prevent further deterioration of the situation and uphold the hard-won process of political settlement of the Syrian issue. Q: Was the Chinese side given any advance warning that the missile strike was going to be carried out? A: I have no information on that. Q: Will the military action by the US against Syria have any impact on the agenda of the meeting between President Xi Jinping and President Trump at Mar-a-Lago? Will they, as a result, put more weight on the Syrian issue? Some also said that the strike will offset the China-US presidential meeting. How do you comment on that? A: I have already made clear China's position on the latest developments in Syria. We are all following closely the meeting between the Chinese and US presidents at Mar-a-Lago, which we hope will promote mutual understanding and cooperation between the two sides, and chart the course for future development of bilateral relations. I will not get ahead of their talks and predict how they are going to prioritize their topics, but I believe they will exchange views on bilateral relations, international and regional issues of common interest and what they think are important and urgent. Q: Do you think the Trump administration's military action in Syria is sending a message to the DPRK? A: China's position on the nuclear issue of the Korean Peninsula is consistent. We maintain that a dialogue-based peaceful and proper settlement serves the interests of all sides. The Chinese side will work along with all relevant parties for denuclearization, peace and stability of the Peninsula. Q: Has there been any communication between the Chinese and Russian sides on the US strike against Syria's military base? A: To my knowledge, the UN Security Council members, permanent members in particular, have been in close communication over these days on the issue of chemical weapons in Syria. Q: Does China consider the missile strike on the Syrian airbase to be within the scope of international law? Or do you think it violates existing rules about intervention in other country's sovereign territory? A: The Chinese side has always stood for a political settlement of the Syrian issue. Under the current circumstances, we hope all parties can keep calm, exercise restraint and avoid escalating the tension. The latest developments in Syria highlight once again the urgency of resolving the Syrian issue through political means. We call on all parties not to walk away from the process of political settlement. Q: Philippine President Duterte ordered the Philippine military to occupy Philippines-claimed islands in the South China Sea. How do you respond to that? A: The Chinese side is committed to defending its territorial sovereignty and maritime rights and interests in the South China Sea, and safeguarding peace and stability there. The overall situation in the South China Sea is getting better. This has not come easily and deserves to be cherished and preserved by all parties. Having noted the report, the Chinese side is concerned about it. We hope the Philippine side will continue to properly manage maritime disputes with China and work with us to maintain the sound and steady growth of China-Philippines relations. Q: Has there been any progress in the relationship between China and Sao Tome and Principe since the two countries restored diplomatic ties last year? Can you tell us more about the visit by the prime minister of Sao Tome and Principe? What is the significance of the visit? A: Ever since the two countries resumed bilateral ties on December 26 last year, friendly cooperation has fully unfolded thanks to the concerted efforts of both sides, achieving steady progress and early harvest. The Chinese side will work together with Sao Tome and Principe to build up political mutual trust, deepen practical cooperation, and increase people-to-people and cultural exchanges, so as to promote sound and smooth growth of friendly and cooperative relations. During Prime Minister Trovoada's visit to China, President Xi Jinping will meet with him, and Premier Li Keqiang will hold talks with him. The two sides will exchange views on the bilateral relationship and issues of common interest, and sign cooperation documents. Apart from Beijing, Prime Minister Trovoada will also visit Fujian and other places in China. Prime Minister Trovoada will be the first African head of government to pay an official visit to China this year, and also the first leader of Sao Tome and Principe to visit China after the resumption of bilateral ties. Both sides attach high importance to this visit, which, we believe, will lay down an overall plan for the development of bilateral relations, and push for new outcomes in mutually beneficial cooperation. Q: So China is yet to see enough evidence to prove that it was the Assad government that used chemical weapons? A: We are shocked at the latest chemical weapons attack in Syria and strongly condemn it. The Chinese side supports relevant UN agencies in carrying out independent and comprehensive investigations into all uses or suspected uses of chemical weapons and, on the basis of solid evidence, reaching a conclusion which can stand the test of history and facts. Q: When answering questions about China's construction of hangars and deployment of radars on islands and reefs in the South China Sea, the Defence Ministry spokesperson said there is no such issue as "artificial islands". How should we understand that? Is China denying the existence of those islands or those issues? Or does China mean that those islands are naturally formed rather than man-made? A: The Chinese side has repeatedly expressed its position on construction in the South China Sea. Necessary construction by the Chinese side on some of its islands is to improve the working and living conditions of people stationed there, and better its public services for international vessels passing by. Meanwhile, the deployment of necessary national defence facilities is for the aim of safeguarding China's own territory. Follow-up: What is China's view on "artificial islands"? A: China has never used that term. Relevant islands where we station our personnel are not created by magic tricks. They have been there since always. Necessary construction by the Chinese side on relevant islands is to improve the working and living conditions of people stationed there. Q: Which Chinese leaders will meet with French Foreign Minister Ayrault during his visit to China? What is his agenda? Will he talk about the Syrian issue? 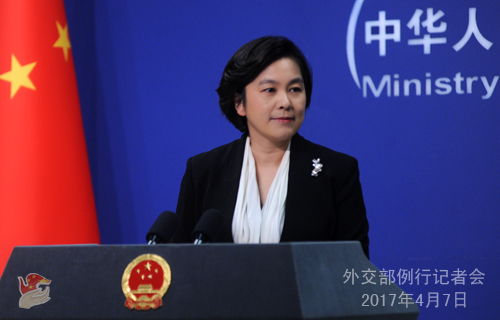 A: During Foreign Minister Ayrault's visit to China from April 13 to 14, Vice Premier Liu Yandong, State Councilor Yang Jiechi and Foreign Minister Wang Yi will meet and hold talks with him. I cannot predict the specific topics of their discussion, but I believe the two sides will exchange views on China-France relations and issues of common concern. Q: Does China still consider the Assad government to be the sole legitimate government in Syria, and view it as an important ally? Do you think that the new US administration's actions signaled a shift from recognizing the Assad administration toward pursuing a regime change? A: You'd better ask the US side whether their actions indicate a shift in policy. The Chinese side upholds the principle of non-interference in others' domestic affairs. We believe that the future of Syria should be left in the hands of the Syrian people themselves. We respect the Syrian people's choice of their own leaders and development path. People have been living in distress since the outbreak of Syrian conflict seven years ago. We hope that the international community will step up its support for the UN as the main channel of mediation, sustain the ceasefire and advance the hard-won process of political settlement of the Syrian issue. Q: You did not criticize or condemn the US missile strike. Does that mean that China gives its approval to the strike? 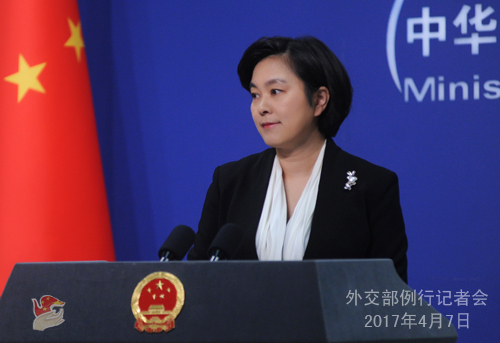 A: The Chinese side always opposes the use of force in international relations and maintains that disputes should be peacefully resolved through political and diplomatic means such as dialogue and consultation. I have just now expressed our concerns over the developments in Syria and our consistent position that the Syrian issue should be resolved through political means. Given the current situation, we hope that all parties can keep calm, exercise restraint, prevent further deterioration of the situation and uphold the hard-won process of political settlement of the Syrian issue. Q: On Syria and many other issues, the UN Security Council has been paralyzed by splits between permanent members. Does China consider the Security Council useless? What is China willing to do to change that situation? A: The Security Council is mandated to safeguard international peace and security by the UN Charter. And the Security Council should follow the rules of procedure stated in the Charter. The Chinese side maintains that the Security Council should stay united and speak with one voice on major issues concerning international peace and security.